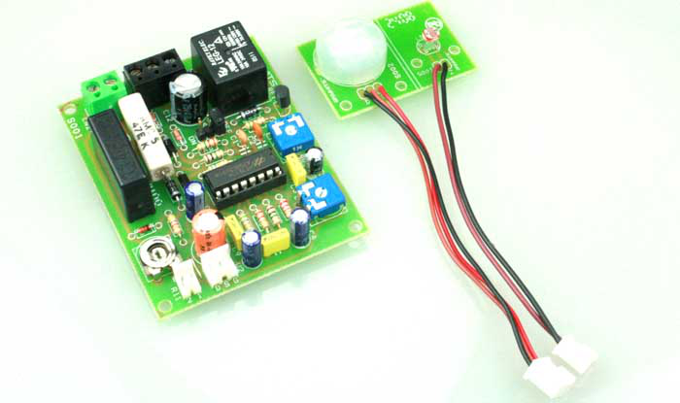 This project is an automatic PIR sensor. 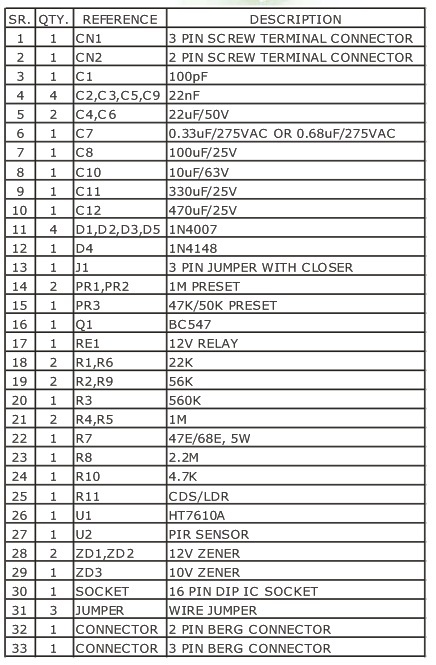 Project is based on Holteks IC HT7610A, which is a CMOS LSI chip designed for use in automatic PIR lamp, flash or buzzer control. 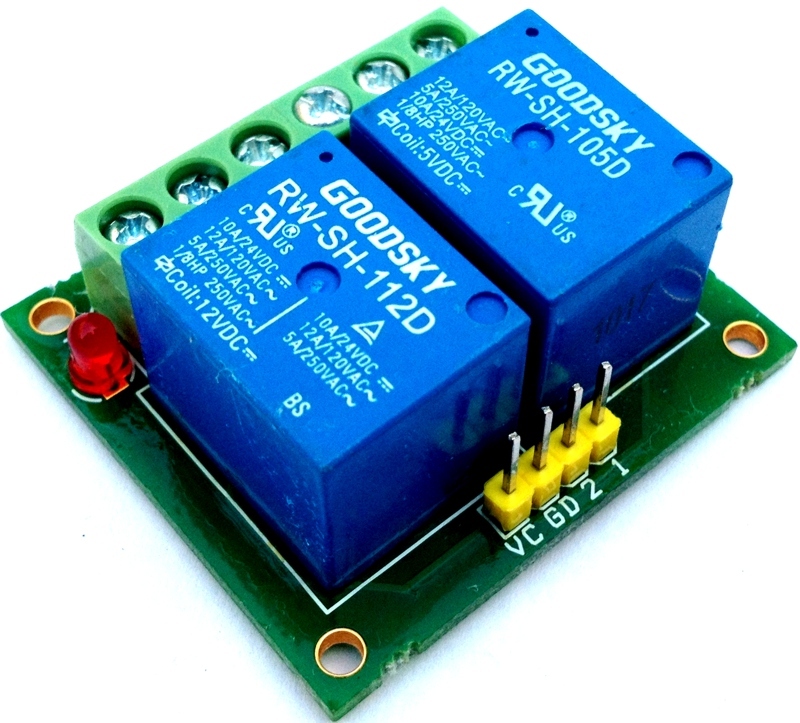 It can operate in 3-wire configuration for relay applications. In our project we have used relay instead of Traic to connect any kind of load in output, HT7610B IC is suitable for traic and HT7610A for Relay application. The chip is equipped with operational amplifiers, a comparator, timer, a zero crossing detector, control circuit, a voltage regulator, a system oscillator, and an output timing oscillator. 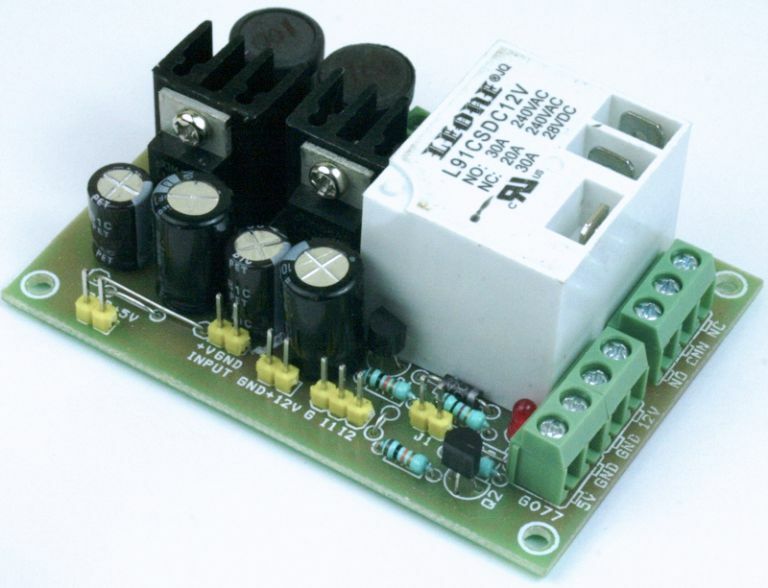 – Load Current 80mA when relay is on. – (HIGH Voltage On Board) Do Not touch the PCB while power is on. 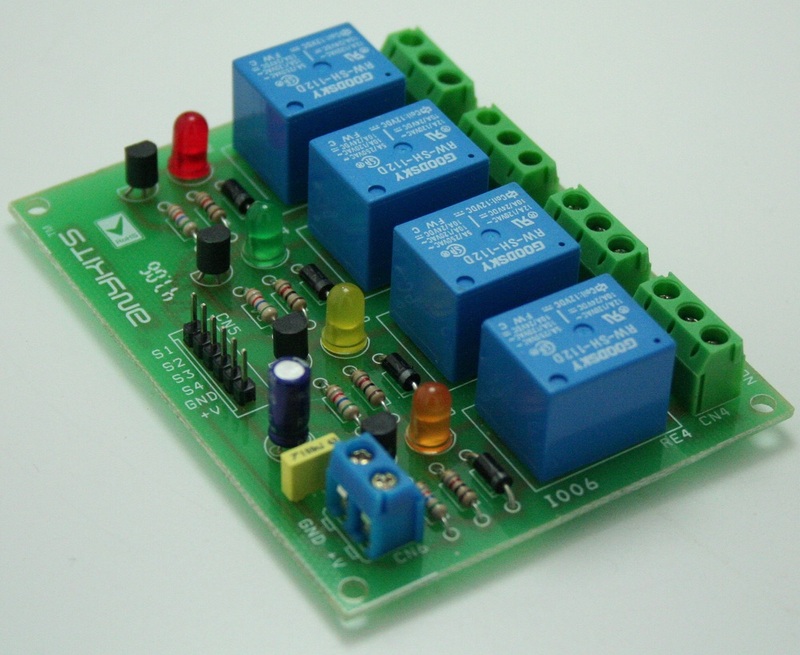 This project offers three operating modes (ON, AUTO, OFF) which can be set through the MODE pin. While the chip is working in the AUTO mode the user can override it and switch to the TEST mode or manual ON mode, or return to the AUTO mode by switching the power switch. J1 Jumper is to set the desired modes. mode, the chip allows override control by switching the ZC signal. CDS is a CMOS Schmitt Trigger input structure. It is used to distinguish between day time and night time. When the input voltage of CDS is high the PIR input is enabled. On the other hand, when CDS is low the PIR input is disabled. The input disable to enable debounce time is 5 seconds. Connect this pin to VDD when this function is not used. The CDS input is ignored when the output is active. OSCD is an output timing oscillator input pin. It is connected to an external RC to obtain the desired output turn-on duration. Variable output turn-on durations can be achieved by adjusting variable resistor or setting various values of RC. The PIR signal amplifier requires a warm up period after power-on. The input should be disabled during this period. In the AUTO mode within the first 10 seconds of power-on initialization, the circuit allows override control to enter the test mode. After 40 seconds of the initial time the chip allows override control between ON and AUTO. It will remain in the warm up period if the total initial time has not elapsed after returning to AUTO. In case that the ZC signal disappears for more than 3 seconds, the chip will restart the initialization operation. However, the restart initial time is always 40 seconds and cannot be extended by adding CRST to the RST pin as shown in the circuit. The HT7610A offers mask options to select the output flash (3 times) when changing the operating mode. The output will flash 3 times at a 1Hz rate each time it changes from AUTO to another mode and flash 3 times at a 2Hz rate when it returns to the AUTO mode. However the output will not flash if the mode is changed by switching the MODE switch. Options for effective override: Once or twice Off/On operation of power switch within 3 seconds. Options for output flash to indicate effective override operation. Flash for the circuit. – 0.34 seconds >/2 trigger signals within 2 seconds with one of the trigger signal sustain 0.16 seconds. – The effective comparator output width is selected to be 24ms. When the chip is working in an AUTO mode (MODE=open), the output is activated by a valid PIR trigger signal and the output active duration is controlled by an OSCD oscillating period. The lamp can be switched always to ON from the AUTO mode by either switching the MODE pin to VDD or switching the ZC signal by an OFF/ON operation of the power switch (OFF/ON once or twice within 3 seconds by mask option). The term override refers to the change of operating mode by switching the power switch. The chip can be toggled from ON to AUTO by an override operation. If the chip is overridden to ON and there is no further override operation, it will automatically return to AUTO after an internal preset ON time duration has elapsed. This override ON time duration is 8 hours. The chip provides a mask option to determine the output flash times (3 times) when changing the operating mode. It will flash 3 times at a 1Hz rate each time the chip changes from an AUTO mode to another mode or flash 3 times at a 2Hz rate when returning to the AUTO mode. But if the AUTO mode is changed by switching the MODE switch it will not flash. 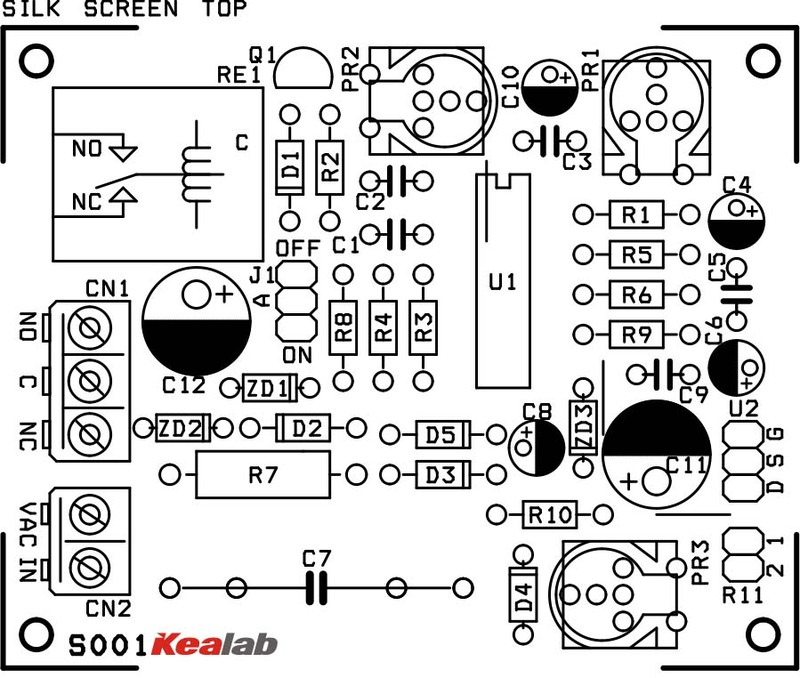 May I know the model of the PIR sensor used in the circuit? Your prompt response will be much appreciated. Thanks a lot in advance! 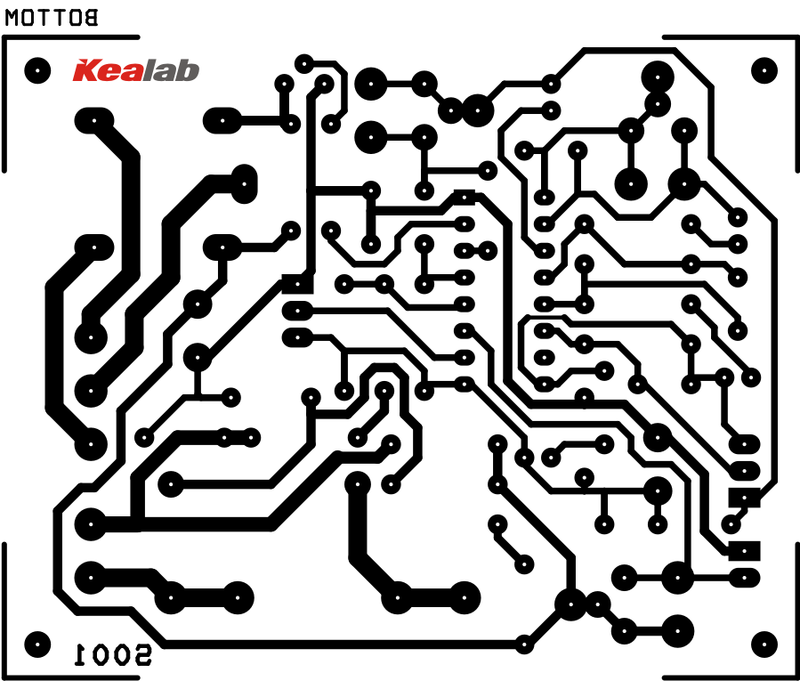 Another concern for the relay, what model of relay was used in the circuit? Please inform me another equivelent IC for this. Cannot find it. In the AUTO mode within the first 10 seconds of power-on initialization, the circuit allows override control to enter the test mode : THIS CAN BE ACHIVED USING 10 SEC POR (Power On Reset) USING RC+D COMBO THEN TO 40106 (A) (THIS HAS 6 SCHMITTREGED STAGES), then to the control circuit. FOR LDR AVOIDING/TUNING USE OPAMP (B) STAGE IS REQUIRED. 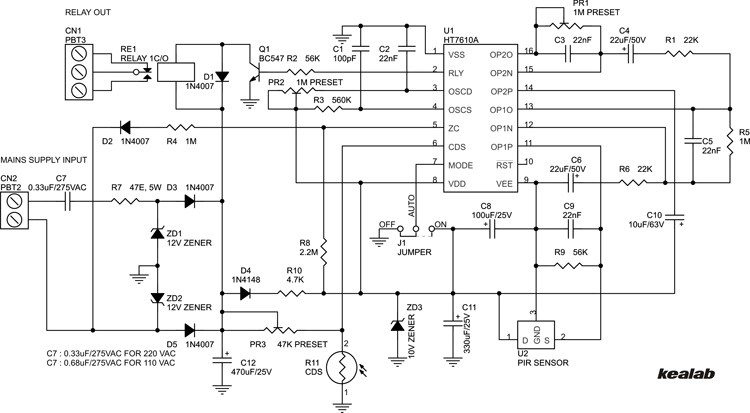 SIMILAR TO LDR, PIR OUTPUT CAN BE TUNED/TRIGGER LEVEL WITH OPAMP (A) with one more on delay with same R.C,D. AND ‘106 STAGE. WHEN THE PIR SIGNAL GOES OFF ONE OFF DELAY (4 SEC – OR MORE.FOR UPTO 10 SEC ADJUSTABLE DELAY INSTEAD OF R, PUT ONE 100K PRESET) CAN BE MADE RC+D(REVER TO THE FIRST SIMILAR STAGE). WITH 10K AND DIODE (w.r.t on/off delay the direction of diode will changed ) and after this one cap 100mfd/16 v; then one 40106(b) stage. the o/p of “b” will give a time delay of 1 sec. that’s it. then for final o/p s u can use 40106 (out of 4 balance stages) & any quad AND GATE. DRIVING RELAY WITH BC547 AS SHOWN.